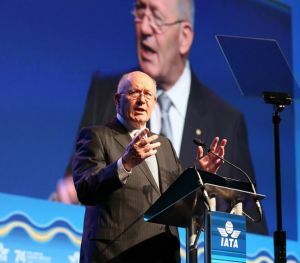 With an opening address by Sir Peter Cosgrove, Governor General of Australia (See BTN 4 June), the International Air Transport Association membership gathered for its 74th AGM at Sydney last week with director general Alexandre de Juniac again expressing the wish that more low-cost airlines should join the 290-member organisation. Budget carriers clearly gain from IATA and its actions and influence without paying the up-front fees! Figures published show that IATA members carried 2.7bn passengers last year, of whom 1.2bn were international. Members represent 82% of total scheduled worldwide traffic (revenue tonne-km). IATA members come from 120 countries. The event is an intense three days of networking, presentations and open-forum discussion, plus behind-the-scenes meetings at all levels and a series of press conferences including the three Alliances. Unlike some of the airlines it represents, IATA is run to a very strict timetable and actually finished 15min early at the final media gathering. The event did end on slightly sour note with incoming IATA chairman Akbar Al Baker being less than diplomatic regarding female airline chiefs, although his own country, Qatar, is probably the most emancipated of all the Gulf states. He was quick to apologise. Al Baker is probably under more pressure than most, with the Kingdom of Saudi Arabia, the Arab Republic of Egypt, the Kingdom of Bahrain and the United Arab Emirates completing the first year of what he has termed an illegal blockade against the State of Qatar. Director-general de Juniac noted in his opening address that the international air transport industry faces challenges involving creeping re-regulation, maintaining the integrity of global standards, and problems with airport capacity. At the same time, rising oil and labour costs and the growing forces of protectionism continue to cloud the horizon for the world’s airlines, delegates heard. On the Alliance front, technology was to the fore with firstly oneworld adding Fiji Airways as its first ‘connect’ partner, with more to follow. “Only questions on Fiji” said communications director Mike Blunt. He should have known better. “How was London - Perth doing?” came the retort “and does it affect Fiji?”! Star Alliance CEO Jeffrey Goh spoke of digital technologies (see Star Alliance looks ahead in this issue) and finally Sky Team announced a change of management with the popular Perry Cantarutti returning to Delta as senior vice-president alliances, replaced by Kristin Colvile, a Delta/Northwest stalwart most recently helping to transform the airline’s cargo throughput. Sky Team is also moving forward with what it calls the SkyLink Digital Spine. It will now become possible for passengers to book seamlessly, free seats, paid-for seats and other ancillary products for all legs of their journeys, regardless of which SkyTeam member they are ticketed with. Brexit got a mention and the general view was that nothing would change regarding bilaterals but governments should be aware that routes and timetables need a six-month lead-in due to the complexity of integrating operational and commercial features. Host airline Qantas CEO Alan Joyce was keen to promote “Project Sunrise”, London - Sydney non-stop, and if proven commercially viable, an aircraft order next year and operational by 2022. “Weight saving is our priority”, he said. IATA wants “smarter regulation” principles from governments, said de Juniac, who highlighted "creeping re-regulation” issues in Brazil, Italy, the Philippines, and Latin America as examples, while US Senate proposals to regulate what airlines can charge for re-booking, cancellation, checked baggag, and seat selection amount to “a stunning reversal of US deregulation. Leave it to airlines to decide seat widths, not politicians”. De Juniac also urged governments to implement global standards to which they have agreed. “We must take governments to task,” he said. “It is unacceptable that global standards are being ignored by the very governments that created them.” For example, the IATA director-general cited issues in India, where the government helped create resolutions prohibiting tax on international tickets and yet it continues to tax international travel. Meanwhile, the industry finds itself in a capacity crisis, as 100 of the world’s biggest airports suffer capacity constraints, according to IATA. There remains a lack of required airport infrastructure investment to solve the problem, said de Juniac. Privatisation of airports is not the solution, he added, citing IATA performance benchmarking research showing that privatised airports become more expensive to operate than those in public hands. Corporatisation, with governments retaining ownership, generally provides a better outcome for consumers and the economy, according to IATA. In response, members unanimously passed a resolution calling on governments to prioritise long-term economic and social benefits delivered by an effective airport ahead of any short-term financial gains from privatisation. Other resolutions passed at the AGM included denouncing human trafficking and committing to anti-trafficking initiatives. Despite uncertainty surrounding tariff wars and business confidence taking a hit, the industry remains positive about travel growth, said Brian Pearce, IATA’s chief economist, in his annual discourse. The association expects air travel to increase by 7% this year, down from last year’s 8.1% but still ahead of the 20-year 5.5% average. The AGM concluded with a passionate speech by Peter Davies of the Airline Management Group on the work of Airlink, a non-profit organisation dedicated to responding to rapid-onset disasters. It is supported by 35 commercial and charter airlines. Davies wants more to join.